First things first....we have a Wicked Winner! Wet n Wild Poison Ivy will be going to Haley L. once I have her address. Congrats, Haley and a big thanks to everyone who entered! This week it's Sinful Colors Black Magic...which I actually haven't posted about yet. Very soon! I will tell you this much about it, it's really cool! Tiny gunmetal glitter and small pumpkin orange hexagons. I don't have anything else remotely like it and I rushed out and bought it as soon as I could. I knew I had to share a bottle with some lucky person out there too! over OPI Did You 'ear About Van Gogh? 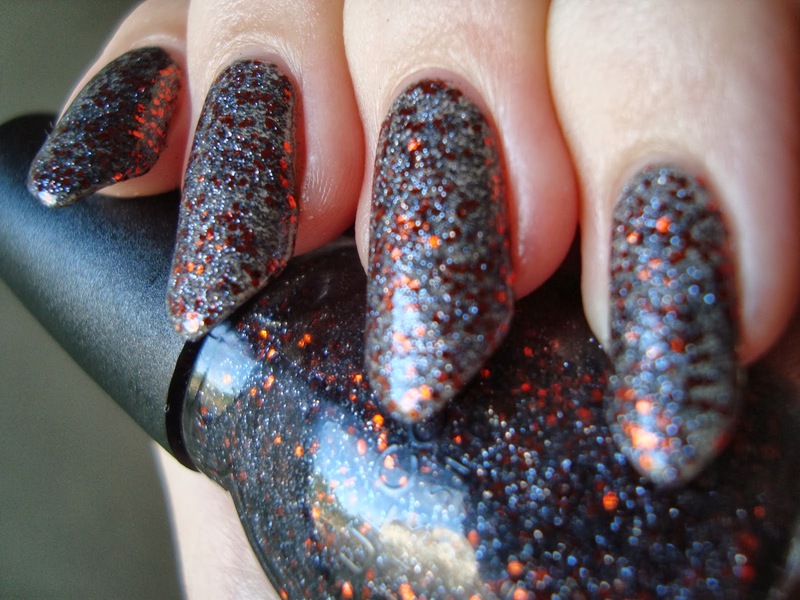 It's denser than a lot of their glitters and could probably stand alone at 3-4 coats. I love the depth of it. 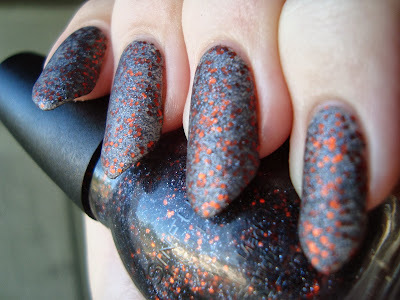 I'm not usually a fan of orange, but this orange is so perfect for Halloween and the gunmetal is awesome too! It's a twist on the typical black and orange. ....and now the important part, since the review's not ready... Enter to win a bottle for yourself! This giveaway will run until midnight US-EDT next Wednesday, when the next will start. Giveaway is subject to the terms and conditions listed in the widget. Please read carefully before entering, as invalid entries may delay the announcement of the winner. Winner will be announced in next week's Wicked Winnings Wednesday post. Good luck!